I put together this card for February's second Viva la Verve sketch. It's still super cold here and my basement stamp room is equally cold, so this is another pretty simple design. 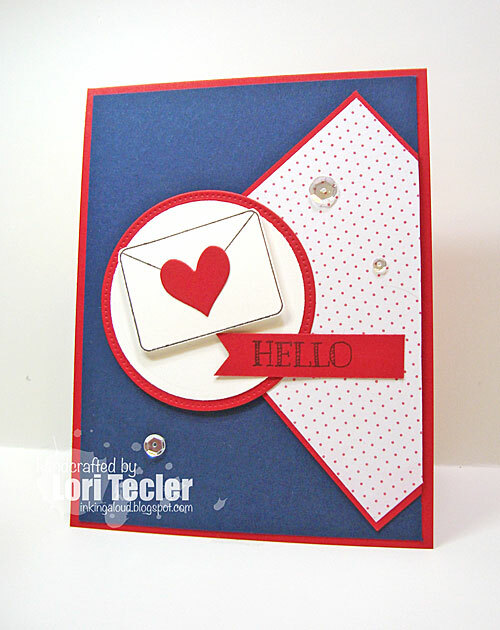 I stamped the envelope from Verve's Take Note set on white cardstock and cut it out, then added a red heart, die cut with the Heart Quartet die, to it. I used foam tape to adhere it to a white circle die cut for dimension and to set it off from the white background. After matting the panel on a red circle, I set it on a contrasting navy blue cardstock panel over a piece of angled red dotted patterned paper. I stamped the set's "hello" sentiment on a red hand-cut fishtail flag strip and added that over the two panels. A few clear sequins scattered around the panel gave the simple design a little sparkle. This is just darling! Love your heart sealed envelope. Thanks for playing along with VLV! Adorable Lori! Love the colors! Thanks for playing along!